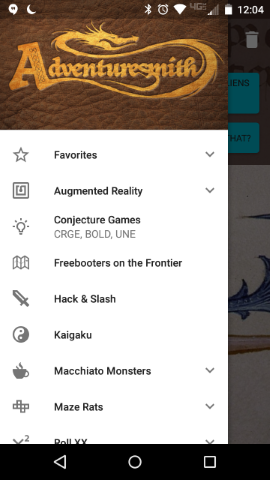 Adventuresmith is an Android app for randomly generating elements for tabletop RPGs (names, spells, items, monsters, characters, alien worlds, etc). Adventuresmith is free, and ad-free (and will remain so). Adventuresmith software is licensed under the GPL. Depending on the source of the content, the licensing terms of the content within Adventuresmith varies – see this section for content attribution and information about the content within the app. Random tables are a great tool to provide a framework for improvisation. the second gives you many more hooks to help you create a memorable character to interact with your players. 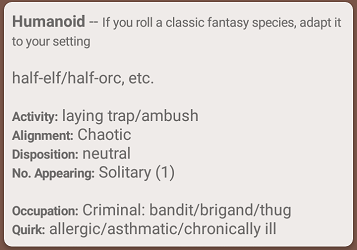 … would you have come up with an asthmatic half-orc bandit, laying a trap? 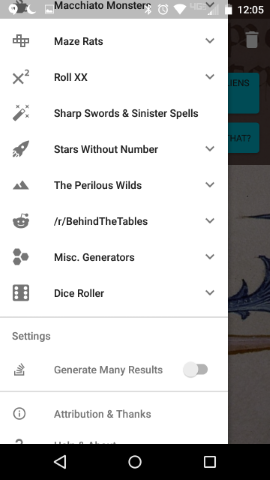 Adventuresmith is a tool to help players and GMs use RPG supplements and systems. Adventuresmith would not exist without the amazing creativity of many people. All content included within Adventuresmith has been used with the permission of the individual content creators. Attribution and licensing statements for all content within Adventuresmith is available here. 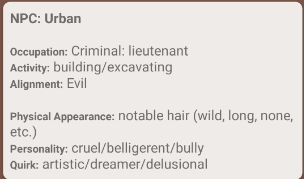 Attribution for each set of generators is also available within the app. When you’ve selected a set of generators, click on the info button on the toolbar to be shown the attribution statement for the generators you’re using. If you enjoy using Adventuresmith, follow the attribution links to the creators’ blogs or to their pages on DriveThruRPG. Give them reviews and other feedback; buy their products, and become a patron on Patreon. Application launch icon, splash screen logo, and nav-drawer-header logo were created by Brian Todd Christensen. Adventuresmith Art by Brian Todd Christensen is licensed under a Creative Commons Attribution-ShareAlike 4.0 International License. Based on a work at https://stevesea.github.io/Adventuresmith/. Permissions beyond the scope of this license may be available at http://briantchristensen.com/Adventuresmith. Adventuresmith source code is licensed under GNU General Public License, version 3 (GPL-3.0). Adventuresmith is maintained by stevesea. This page was generated by GitHub Pages.